Whether you have a cat or a dog or both, you certainly love their company. However, they can also create some inconveniences for you. Pet hair is a serious problem because it gets everywhere and it’s often hard to get rid of. Find out more about the available solutions. This is the surface which tends to collect the largest amount of pet hair. While regular vacuuming helps to pick up the hairs on the surface, some fall deep into the pile and remain stuck there. Deep cleaning is the only solution in this case. The ideal technique and tools for the job depend on the make, weave and height of the pile. Plush carpet, for instance requires special care. Deep cleaning helps remove pet dandruff too and this contributes greatly to the quality of the indoor environment. 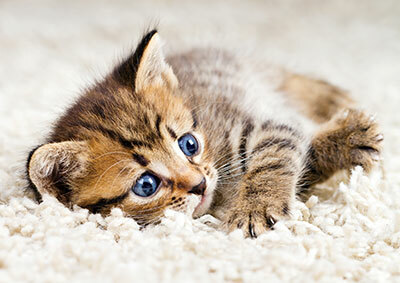 If your beloved kitty or pooch loves to relax on the sofa, you will need proper upholstery cleaning too. It begins with the collection of the hair from every corner of the sofa. The hairs are small and light so you can expect them to spread well beyond the cushions, armrests and backrest. That is why it is extremely important for all tight places to be properly cleaned. The cushions require cleaning from all sides for best results. Even the best trained pet can sometimes do its business on the carpet because of a missed walk, stress, illness and even emotions. Washing the area with water and soap and spraying deodorizer will not help to remove the stain and the odor. There is a need for special treatment which is safe for the carpet in addition to being effective. The sooner the stain is removed the better. Otherwise, the chemicals found in urine may destroy the fibers and dye. Looking for a pet hair cleaning service? Our company is readily available to do the work for you. No matter how bad the situation is, we, at “Carpet Cleaning Hermosa Beach”, will use modern and safe equipment and products to restore the looks and feel of the carpet and upholstery. To hire us, give us a call or send a message. Get more details on our services from our website.